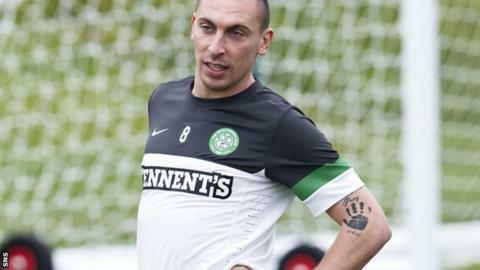 Celtic will ask for Scott Brown to be left out of the Scotland squad when it is named next week for the upcoming friendly away to Luxembourg. The Scottish champions' captain has been battling a hip problem. And Celtic manager Neil Lennon said: "Ideally, I would like him to be left out of that because we have a heavy schedule of games. "I think if there is an opportunity for him to have a break then we will be asking for that." Between Celtic and Scotland, Brown is potentially required for matches every weekend and midweek throughout November. But his hip problem meant he played only the first half of the recent World Cup qualifying game against Wales in Cardiff before missing the second match of the double-header against Belgium in Brussels. The 27-year-old has returned to club duty and is in the squad for the Scottish Premier League clash with Dundee United at Tannadice. However, Lennon might rest the midfielder to ensure he is fit enough to face Barcelona when the Champions League Group G leaders visit Celtic Park on Wednesday. "Scott has proved beyond doubt that he is good enough to play for Scotland," the Celtic boss. "He is playing the best football of his career this season. "He did come back from the Scotland trip not in the best condition, but we half expected that and there is no blame apportioned." The uncertainty over Scotland squad selection is exacerbated by the pending decision over Craig Levein's future as national coach. However, Lennon has no problem with defender Charlie Mulgrew and midfielders Kris Commons and James Forrest, who also both picked up an injury while on international duty, being included for the match in Luxembourg. "Charlie, Kris or James won't be withdrawn, but Scott is an ongoing issue," he added. "James has a bit of a hamstring strain and I am hoping he will be OK for the weekend. "But the rest of the guys are fit and, if they are selected, we won't stand in their way."